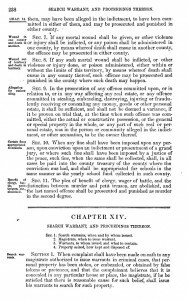 By the time the Oregon Territory was passing its statutes — and the Territory was created in 18486 — the death penalty there was pretty much confined to first degree murder.7 Even second degree murder provided only for a life sentence.8 And so the benefit of clergy wasn’t part of Oregon’s scheme from the beginning. Wager of battle, as it was spelled in the Oregon statutes, or battel, as it was typically spelled, was “a species of trial introduced into England, among other Norman customs, by William the Conqueror, in which the person accused fought with his accuser, under the apprehension that Heaven would give the victory to him who was in the right.”9 A law dictionary that was fairly contemporary with the Oregon statutes simply described this as a “superstitious mode of trial which till lately disgraced the English law.”10 So… um… er… no. Not part of the scheme of things on this side of the Atlantic. Um… not that in Oregon either. Plain old ordinary murder, not petit treason, and plain old ordinary penalties.